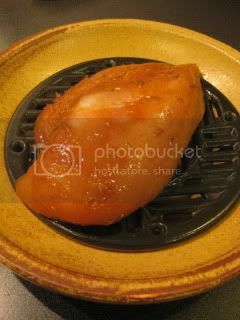 Here's another microwave recipe for unique and brilliant Donabe steam-roaster, TOCHINSAI. This time, I use chicken breast. No oil is used in this recipe...so it's a healthy option for cooking chicken. Making marinade is very easy...soy sauce, honey, curry powder, etc. are whisked together, and chicken is marinated for 2-3 hours before being cooked. Once the chicken is ready to cook, it's set in TOCHINSAI, and just microwaved for 5-6 minutes with the lid on. 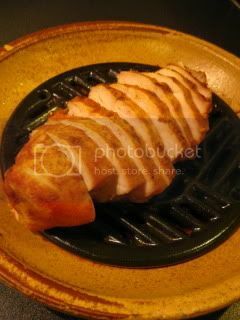 The black glaze of the grate heats up to about 600F, so it cooks the chicken fast and effectively. You can slice the chicken and serve. It makes a nice izakaya-style dish to share.